From Kamijinba the stone paving of Nakasendo turns into stairs so we backtracked along the stone pavement to take the two-lane road we crossed before for Tsumago, via Magome pass. The distance to Magome pass is approximately 2.2km with 138m to climb. 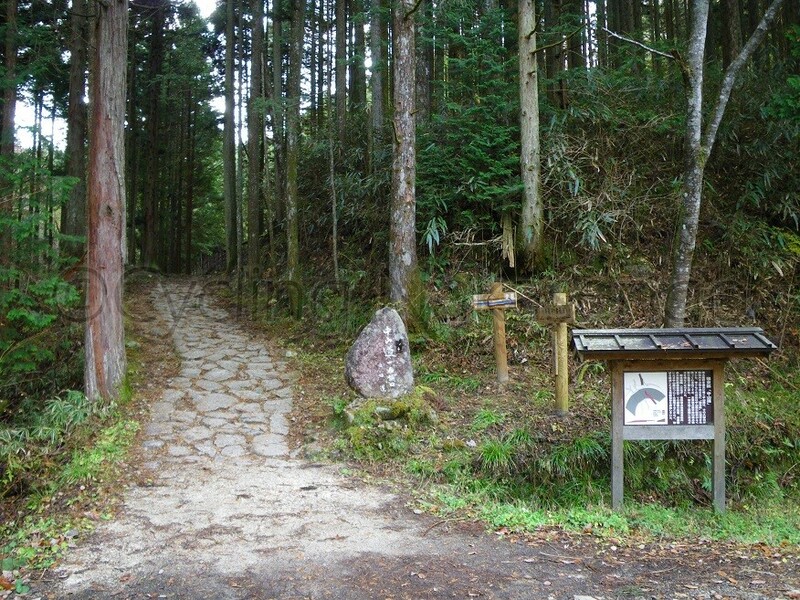 The road declines for 430m and Nakasendo merges with the road from the left, then diverts to the right where it becomes an unsealed trekking track in the forest. 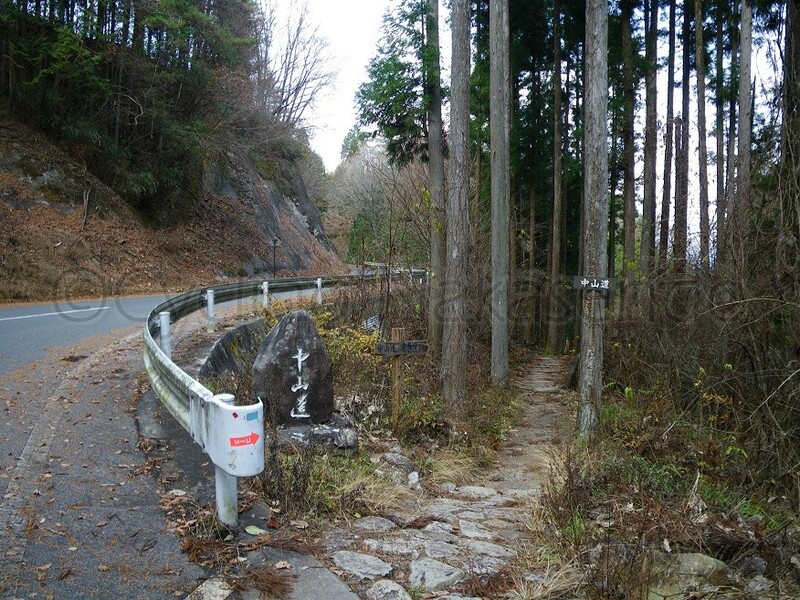 The sealed road we rode along and shared with cars and buses suddenly got steep from there for 350 m at an up gradient of 12.4% to the point where it meets Nakasendo again. 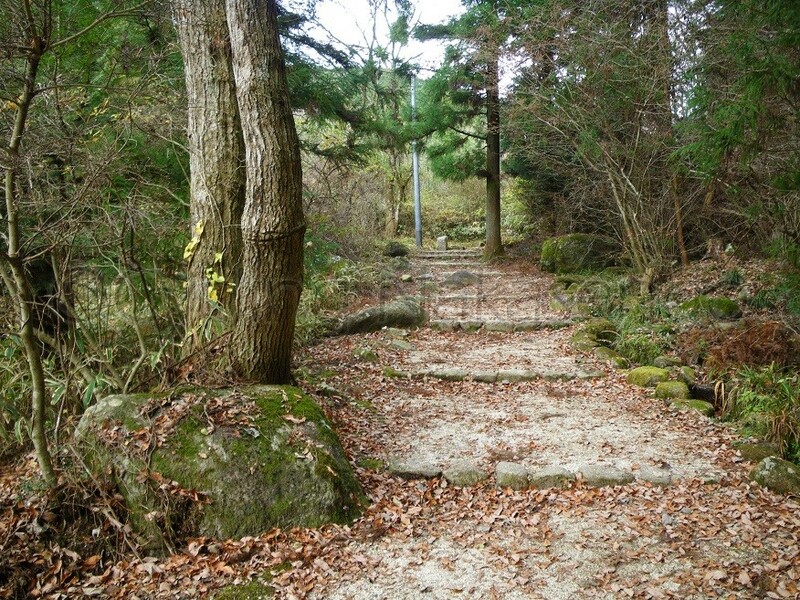 Nakasendo crosses from the right to left side of the asphalt road and is paved with stones right after wooden Iwata Bridge. When seen on a map it climbs straight up, almost perpendicular to the contour lines of the mountain, whereas the asphalt road winds and threads along and around it. We hiked up the stone paved Nashinokizaka (slope of pear trees) to avoid a big bend and got on the red-paved track of Nakasendo after passing a small restaurant. A post-town-like settlement comes up as the slope becomes gentle. This settlement, almost at the peak of Magome pass, was home to people known as Ushikata who made their living from transporting cargo by using oxen. Ox cargo bearers held a very important logistical role along Nakasendo. The service was known as okabune (ship on land). 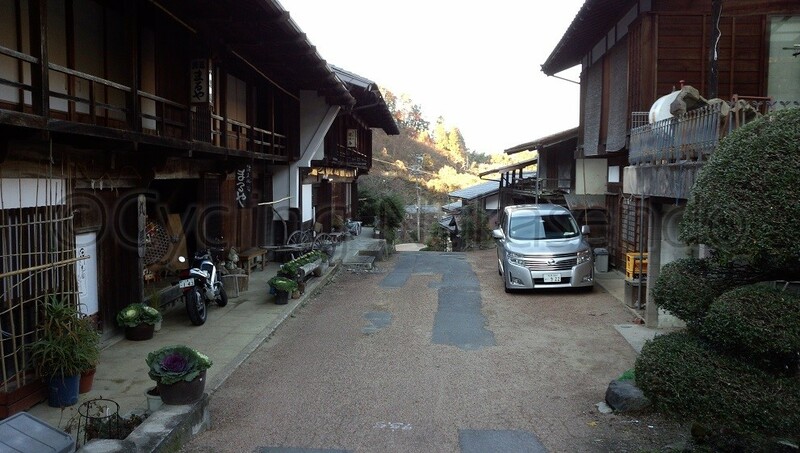 The Ushikata that lived in here provided transport for a wide area along the Nakasendo. 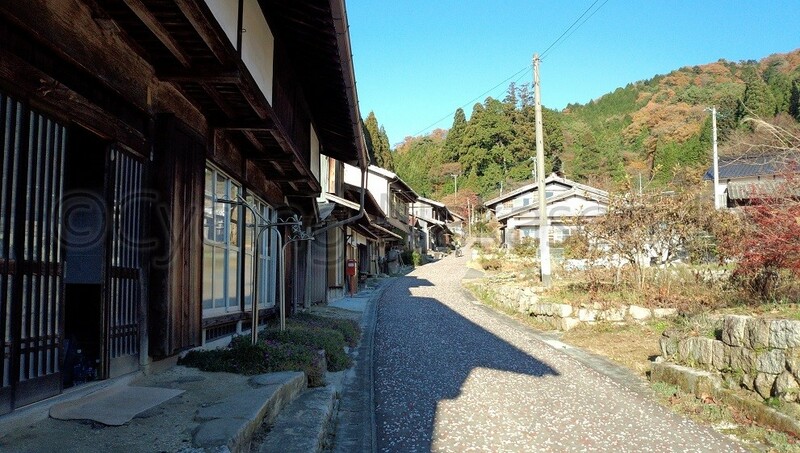 Unlike Magome, it is very quiet and not touristy, and what I like is that the local people have carried on with their traditional way of life, which is in harmony with their natural surroundings. A row of old houses restored after a big fire in 1762 are still home to people in the village. 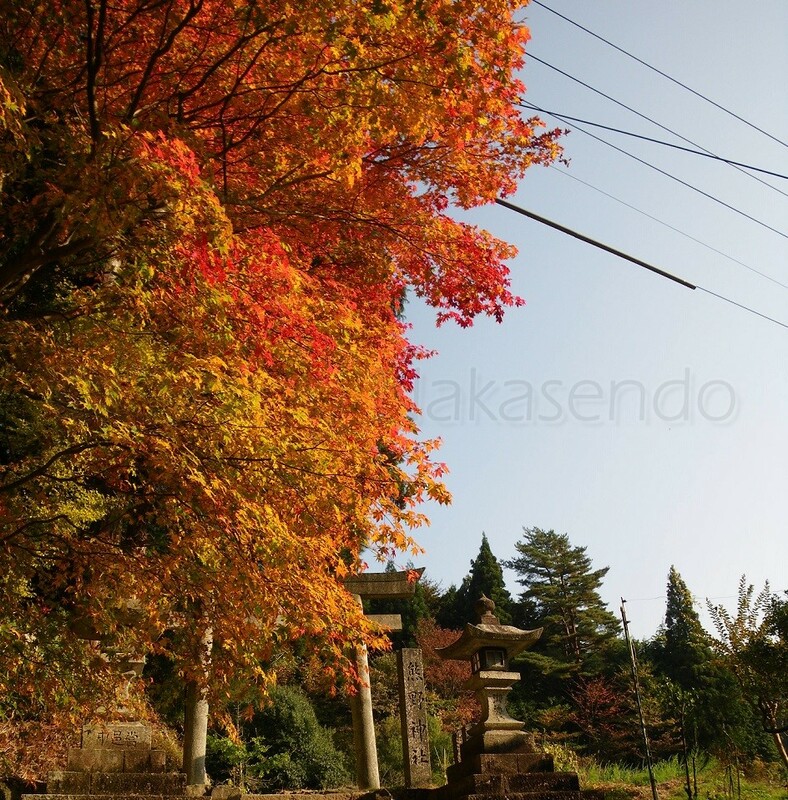 The gradient of the incline gradually became more extreme towards the last slope as it passed Kumano Shrine with a beautiful Japanese maple covered in autumn leaves at the top end of the settlement. 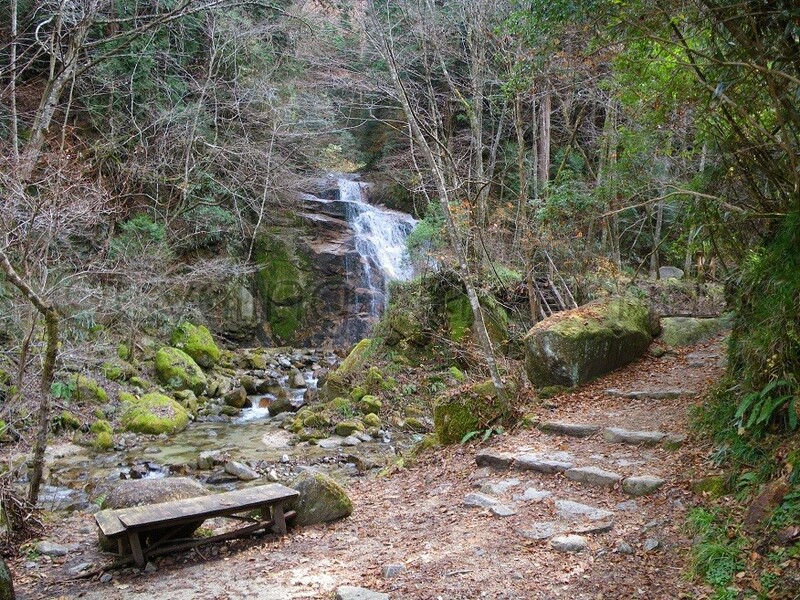 Nakasendo merges with the new road and finally reaches the top of the incline, which is also the border between Gifu and Nagano prefecture. 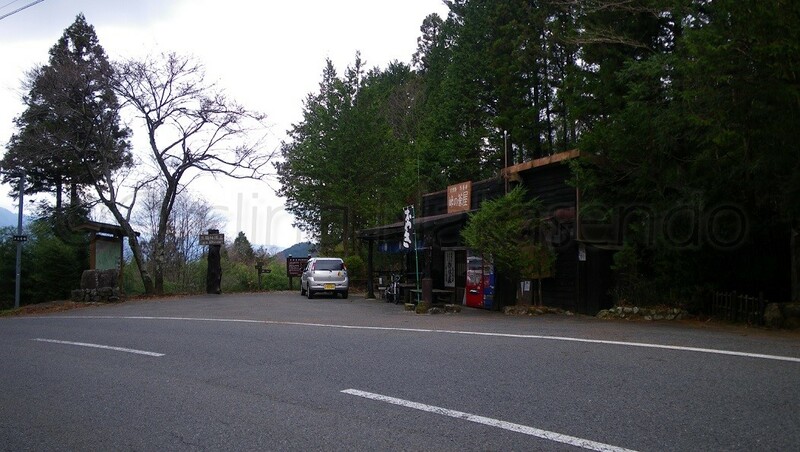 There is a sign that says ‘Magome pass, 801 m above sea level’ and a teahouse next to it where I have had the delicious local snack, goheimochi (sticky rice cakes with sweet walnut-miso sauce) before. The Nakasendo continues as a footpath from behind the teahouse and separates from the asphalted Nagano Prefectural Route 7 we had to take on our bikes. Even though we skipped seeing Odaki and Medaki waterfalls I started to feel that we had to rush because we were running behind schedule. Thanks to the long 5.1 km downhill descent (350 vertical metres) to Tsumago, we charged down as fast as we could. 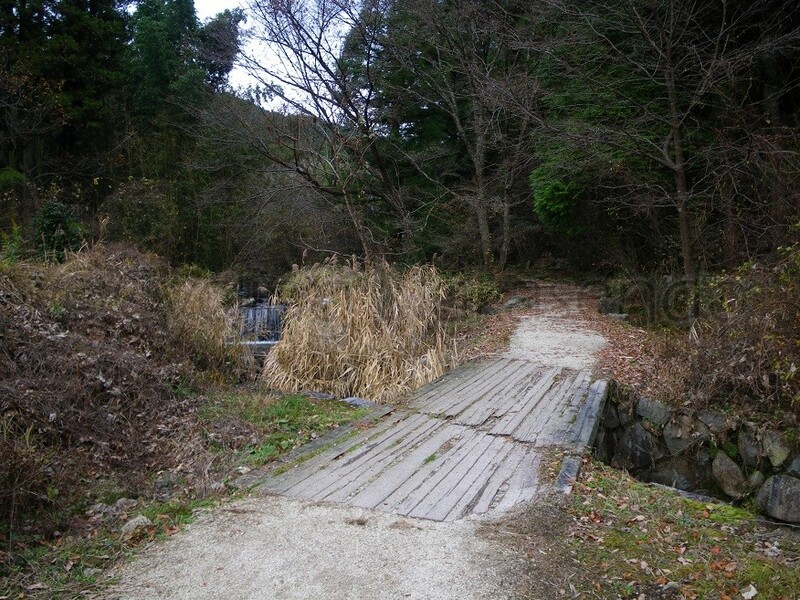 We crossed the old stone-paved route at the corner where there was a bridge over the stream of Otarugawa. As I rode into the narrower part of the valley, I could see that the replacement road for vehicles was formerly narrow but had been widened and modernized for heavier traffic. The breeze through the state protected forest and stream was extremely pleasant but we had to concentrate on traffic passing by and coming onto the road. Most of them were probably tourists and they would not even think that there could be cyclists on the path. 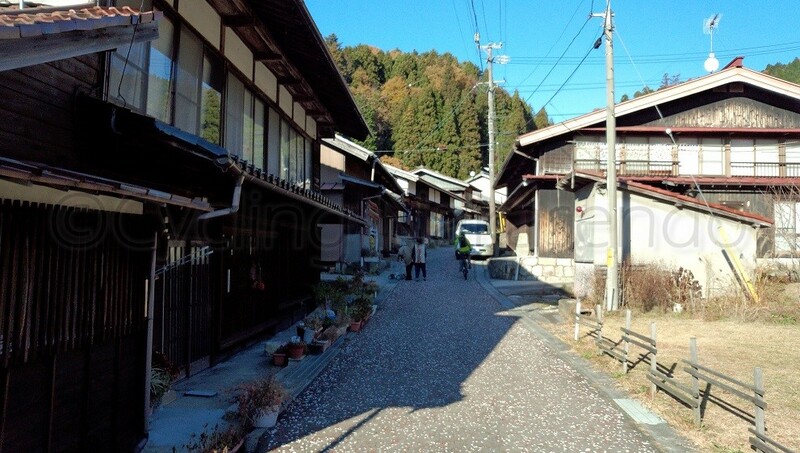 Through some more steep bends, we came up to the point where the view opens up and the stone-paved Nakasendo that runs through the woods joins from the right and crosses to the left into Otsumago, a small post town like settlement before Tsumago. Rows of traditional houses line the street. Their construction is unique in that their second floor is longer so that it overhangs the first floor creating protection from rain or snow at the front of the buildings. Each residence is separated by a firewall made from shikkui (a stucco-like substance made from limestone, seaweed glue and hemp fiber), designed to help slow down the spread of fire. Some of these houses operate as inns. At the point we passed a big sign saying ‘Otsumago’, the old route dropped toward a bridge over the river then diverted left to climb up a steep incline. As the road descended it became gravel and hit stairs. Instead of following this route we kept descending, following the path we were on through a tunnel of colored leaves along the river. Nakasendo’s trail eventually reappeared, joined with our path before a bridge, and then separated again as a gravel track afterwards. 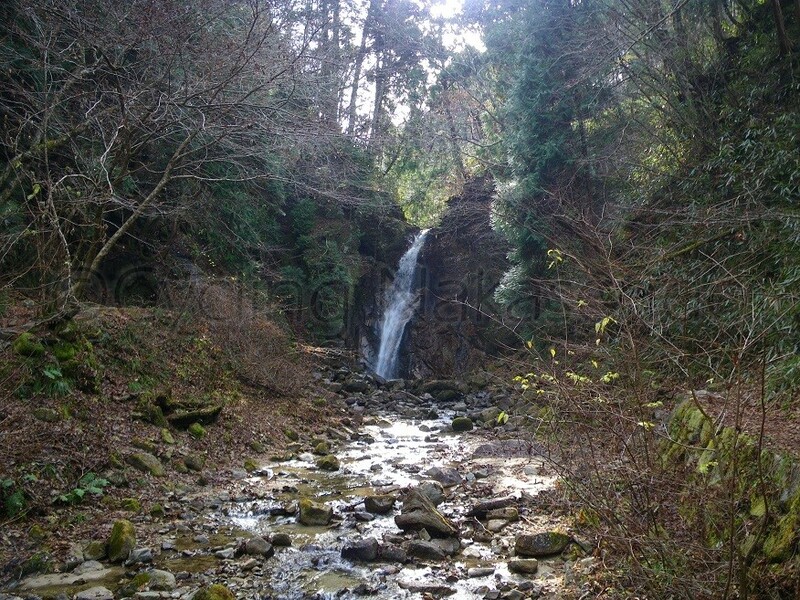 We crossed the river and continued on the same path to the entrance of Tsumago. We followed a bit of the National Route 256, instead of taking the gravel track that was Nakasendo. 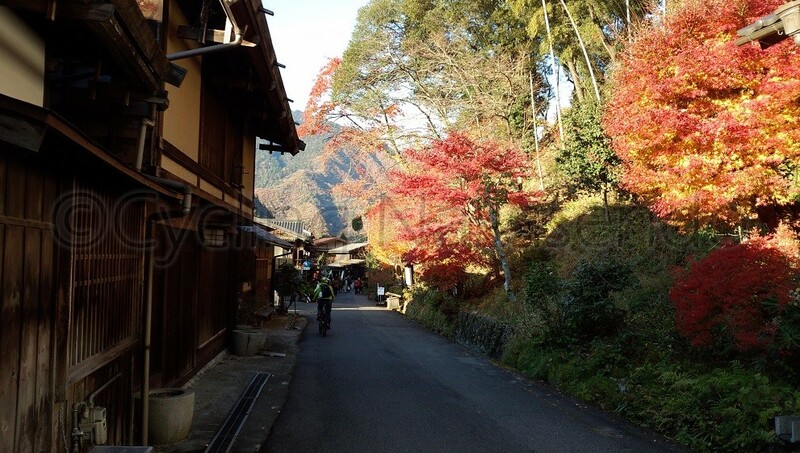 From the beginning of Tsumago, Nakasendo became asphalt and the number of tourists increased dramatically but by not so many that we couldn’t ride along a row of tasteful old buildings and colored maple trees.